Building websites has become a tedious task having to write bits and pieces of code to provide a structure to your website. Well, what if you could simply add a framework and it could do all of that for you? Well, Bootstrap does exactly that. Bootstrap is a framework that allows you to install over your website and offer a structure to it. The website can still be modified and incorporate other elements, but this provides a more proper layout to the website. Bootstrap also offers other features such as jumbotrons, lighboxes, sticky menus and so much more without have to write the tedious coding that’s behind it. This course has been designed to help you master Bootstrap in a simple and effective manner. Using a hands-on approach that includes 5 project based examples, you will learn exactly how to build your website with Bootstrap 4. Bootstrap 4 is not at all similar to the older versions and offers some fairly interesting updates. The latest version strengthens support for some features, while dropping support for others. It now comes with features such as switching from LESS to SASS, added support for Flexbox, dropped support for IE8, IE9 and iOS 6. It has also increased the global font size to 16px, switched from pixels to root ems and have even rewritten all the components and jQuery plugins. 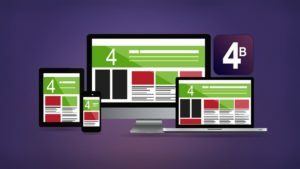 You will cover all of the brand-new features of Bootstrap 4 in here, while also learning how to actually start integrating it into your website design. The 5 features will help you get started from the very beginning, so if you have no experience with Bootstrap, you will still learn a whole lot from this course. Social Networking – This project will show you how to incorporate a number of different feature such as comments, adding photos, groups, and sidebars. Agency – Learn how to add a nav bar on the top, followed by a jumbotron. In this project, you will see how to block of sections of a page to add a different segment of the website and add a contrasting design.